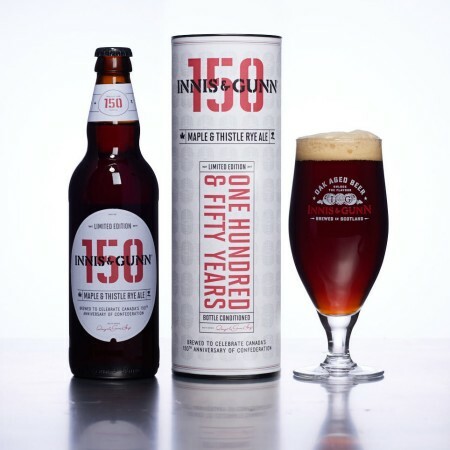 This mighty red ale was brewed with Canadian Malted Rye Crystal and fistfuls of Goldings and Cascade hops, and then matured in 150 oak barrels for 150 days. After maturation, two emblematic ingredients were added: a hint of Canadian maple syrup and Scottish wild thistle. Finally, live yeast added to the bottle ensure the unique brew will continue to develop and mature over time. The result? A big, bold beer that is packed with flavours and aromas of toffee, vanilla, oak, citrus, smoky maple and orange oil. Above all though, it’s packed with love. Maple & Thistle Rye Ale is available now in a limited run of 500 ml bottles in most regions of Canada. For more details on availability and pricing, check with local beer and liquor retailers.